classification of inorganic compounds in 1940. • These rules are still in use today. carbonates which contain the ion CO32–. one metal and one nonmetal. 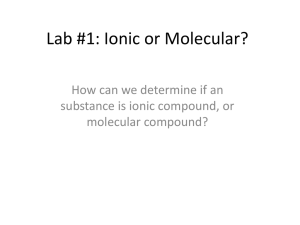 – KCl and AlCl3 are binary ionic compounds. at least one metal and one nonmetal. elements and both are nonmetals. nonmetal. HCl (aq) is a binary acid. other nonmetal. HNO3 is a ternary oxyacid. • A positively charged ion is called a cation. • A negatively charged ion is called an anion. 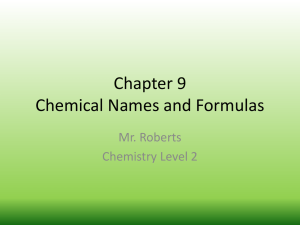 overall charge is a polyatomic ion. • Below is a flow chart for the classification of ions. tin and lead along with Ag+, Zn2+, and Cd2+. • This is called the Stock system of naming cations. 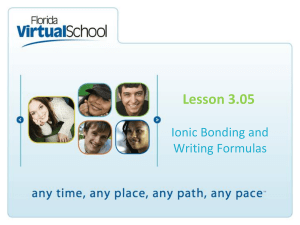 ions and Group IIA/I ions always form +2 ions. lead in Group IVA/14 form both +2 and +4 ions. 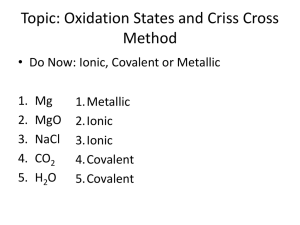 ions: O2-, S2-, Se2-, and Te2-. ions: N3-, P3-, and As3-. • Some oxyanions end in the suffix -ite. the sulfate (SO42-) and nitrate (NO3-). oxygen than the oxyanions than end in -ate. the formula for the chlorite ion? number of oxygen atoms changes. 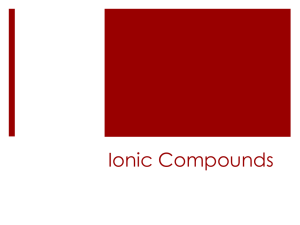 particle of an ionic compound. charge, the formula unit contains one of each ion. 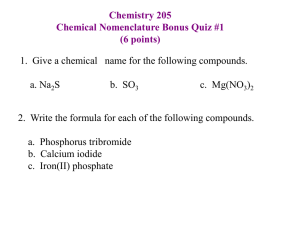 – Na+ and Cl- combine to form NaCl. – Mg2+ and S2- combine to form MgS. – Ca2+ and Cl- combine to form CaCl2. 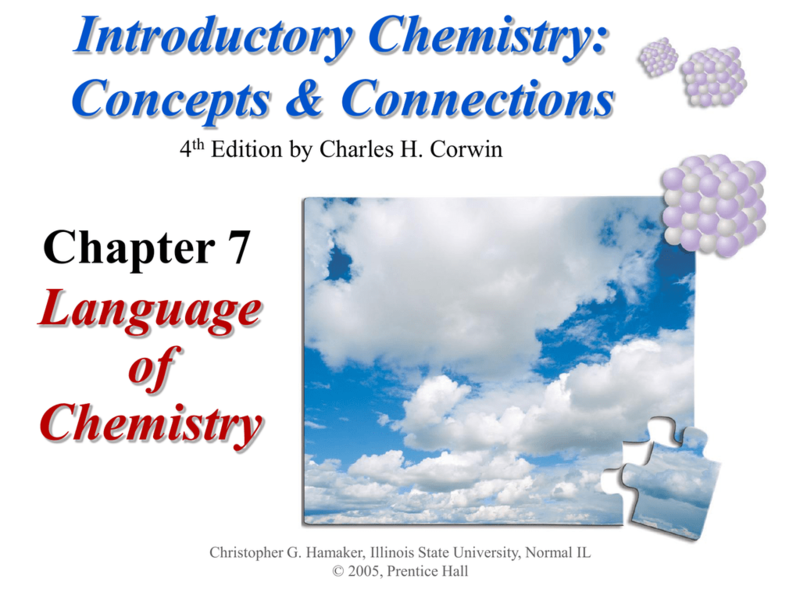 – Na+ and O2- combine to form Na2O. ion, it is placed in parentheses. 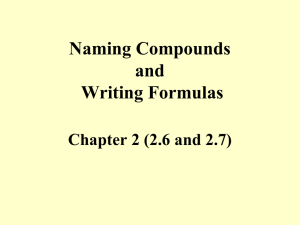 – Al3+ and CO32- combine to form Al2(CO3)2.
charge of an ionic compound must equal zero. 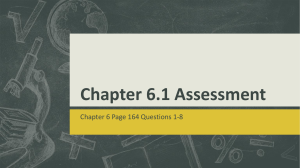 • What is the charge on the iron ion in Fe2O3? the cation first and the anion second. oxide ion, therefore the name is magnesium oxide. • What is the name of cinnabar, HgS? • What is the formula of iron(III) fluoride? formula for iron(III) fluoride is FeF3. 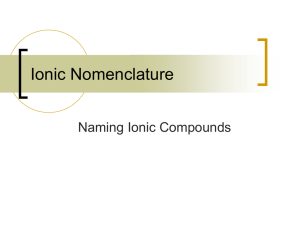 compounds: the cation name followed by the anion name. • K2CO3 is named potassium carbonate. state, we have to determine the charge on the metal. • Co(ClO3)3 is composed of cobalt(III) and chlorate ions. based on the formula of a similar compound. that calcium carbonate is CaCO3? will have the same ionic charge. • The formula for radium carbonate is RaCO3. of a binary molecular compound. and the second element has the suffix -ide. tips. What is the name of P4S3? – There are 4 P atoms, use tetra– There are 3 S atoms, use tri– The name for P4S3 is tetraphosphorous trisulfide. • What is the name for Br3O8? used for the second element. compound containing hydrogen and a nonmetal. compound containing hydrogen and an oxyanion. -ate, the suffix is changed to -ic acid. -ite, the suffix is changed to -ous acid. • Most inorganic compounds do not contain carbon. metal, a nonmetal, and oxygen. • Cations are named the element plus the word ion. second. Then anion has the suffix -ide added. 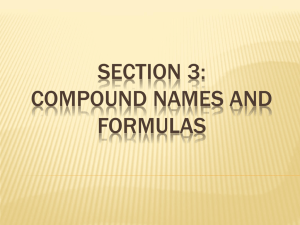 compound is a formula unit. suffix -ide is added to the second element. each atom in the formula. adding the prefix -hydro and the suffix -ic acid. on the oxyanion to -ous acid.